Overall Print Size: 31 1/4" x 23 1/2"
"FIGHTING TIGERS" is a superb depiction of an action fought over the Hsiang Chiang river on August 5, 1944. 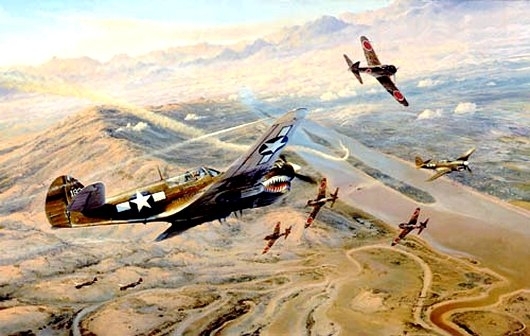 Following a successful attack on Japanese forces just north of Changsha, P-40 Warhawks of the 75th and 16th Fighter Squadrons, 23rd Fighter Group, are attacked by enemy Nakajima fighters and a massive dog-fight has developed with aircraft wheeling and turning in all directions. The action is set against the distinctive, haunting landscape of Southern China, Taylor's panoramic canvas capturing all the atmosphere of a crucial aerial campaign fought in the skies above a distant land so many years ago. Just 500 prints were available worldwide each signed by five Flying Tigers.